Everyone loves Korean BBQ, especially those juicy, tender, and flavorful kalbi or Korean BBQ beef short ribs. Today, Diana of Dianasaur Dishes is sharing her kalbi recipe with us. It’s no surprise that she has a huge passion for Asian cooking which she shares not only through Dianasaur Dishes, but also by teaching free cooking classes to low income families in her community of Auburn, Washington. I have personally tested her kalbi recipe and it’s awesome! Please welcome Dianasaur Dishes to Rasa Malaysia. When I lived in Korea as a small child, I loved getting Galbi from the food vendors on the sidewalk. There was something that felt so right about holding a piece of beef in my little hand and gnawing the meat off of tiny bones. When I moved to Hawaii, I was delighted that Galbi was still so abundant, only it was called Kalbi Ribs instead. All the little old Korean ladies at my church loved to bring the tasty ribs to potlucks, and they were at pretty much every holiday gathering I went to. The key to a good marinade for kalbi ribs is a balance of flavors, both sweet and savory. Traditionally, honey or sugar was used for sweetening the marinade. I remember watching the wives of vendors in Korea grating Asian pears, and sweetly hinting to them that I LOVE Asian pears. They always took the hint and handed me one to which I politely said “Gamsa hamnida” (which means thank you). When I asked the Korean women I know about the Asian pear they agreed that you need to grate both Asian pear and onion into your marinade, this imparts more flavor than simply chopping them. Some of the women I talked to make their Galbi very sweet with soda, Asian pear and sugar in their marinade. I think that has been a bit westernized because I don’t remember the Galbi in Korea being nearly as sweet, so I leave the extra sugar out. Two important keys to making kalbi ribs are to make sure you buy Korean style short ribs, and to soak them before marinating. The Korean style ribs are cut perpindicular to the bone, so you end up with an 6-10 inch strip of meat and three small bone segments attached. You can definitely find them at any Asian grocery store, but they’re often at local grocers and butchers as well. Because the bones are cut during the slicing process, there is a lot of bone dust on the ribs. Soaking them before marinating makes sure this dust is rinsed away. Although the ribs are best on the grill, you can also cook them indoors. Using an indoor grill press they need to cook about 6 minutes, or you can cook them in a large skillet on high heat for 3-4 minutes each side. Kalbi (Korean BBQ Beef Short Ribs). 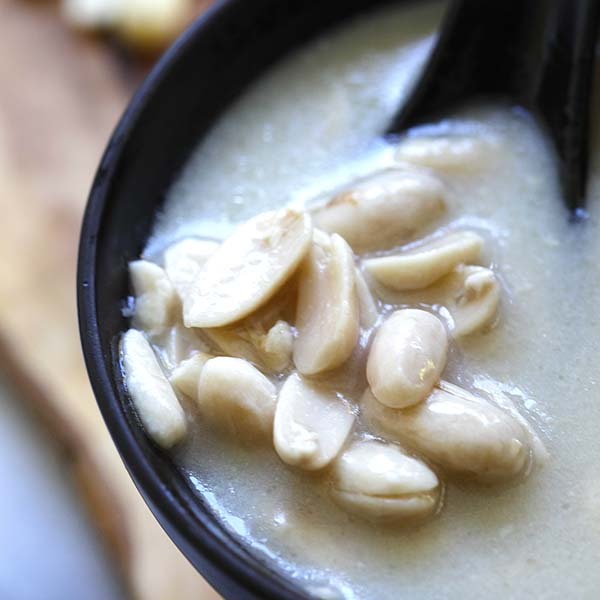 Recipe at rasamalaysia.com. Place ribs in a large casserole dish and fill it with water until the ribs are covered. Let sit in the fridge at least 30 minutes, then pour off water and rinse the ribs and dish. Return ribs to the casserole dish. Grate the flesh of an Asian pear and half of an onion over the ribs. Add all remaining ingredients to the ribs and use tongs stir marinade and make sure ribs are all soaking. Cover the dish and refrigerate at least 30 minutes (overnight is better). Heat a grill to medium high heat. Use tongs to place ribs on the grill and cook for 3-4 minutes each side. Garnish with additional green onion and sesame seeds if desired. 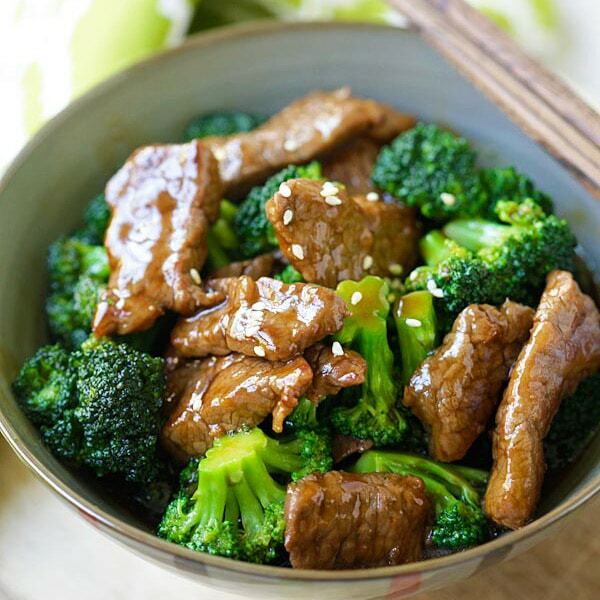 Serve with kimchee and rice. These look really good. I love ribs. They are so tender and juicy. I also like eating with my hands. Thanks for sharing who doesn’t like Galbi,i could eat pounds of this! Wow….Korean Kalbi…..looks finger-licking good! Anything Korean is my favourite. Korean food is one of the best….beautiful in flavour and taste. This dish brings back lots of sweet memories of my 1+ year there. I remember my Korean friends used coke to marinade the meat. Love the kimchi a lot. I make that all the time at home. A classic and one of my favorites. Delicious! Just when I thought I had run out of great short rib recipes, this comes along! Much appreciated. Oh my, YUM! I love kalbi. My mouth is watering. Kalbi is a fav dish for Japanese too :) Juicy meat marinated with the spicy sauce is irresistible, wow! Interesting, we use 7-up in a lot of our meat marinades too. I’m drooling into my keyboard here, those kalbi ribs are perfection! Thanks for this. I love Kalbi and make it every month or so. During the summer I like to do the marinade with steak tips and make steak tip subs out of them! Yummy Kalbi. It’s great to use 2 types of meat tenderizer. Guaranteed tender beef. Thanks for this recipe. My Malaysian wife loves Kalbi and now I can make them for her. I just need to find out how to slice them as thin as the restaurants do. There are 2 Korean restaurants where we live in Cape Town and my wife orders these ribs everytime we go. Greetings from Bangladesh, You have a great site and some extraordinary recipes. all your recipes & instructions produce perfect results. so i always attempt your entries with great confidence. 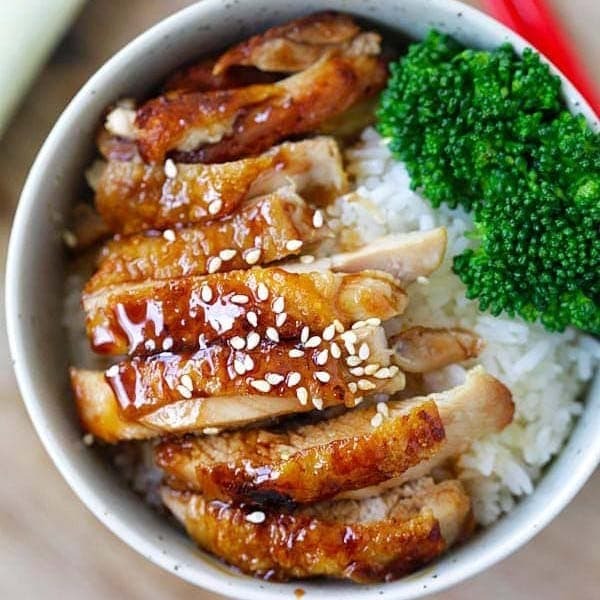 is it alright to use Kikkoman Soy Sauce. Can I substitute any other pear as we dont get Asian pear in Dhaka? Wish you continued success with your blog. I love kalbi! Never done it with the Asian pear before. We eat this with Korean green hot peppers and Korean red chilli paste. So 7-Up instead of sugar or honey? I think I prefer that latter, although the beef looks soooo good. look delicious;) Brings back memories from dining with a little family from seoul in Sydney’s china town. Korean bbq, yummie. Must visit Seoul, cant resist asia. Sounds delicious and have hooked it up tonight, for grilling tomorrow (my grating arm will never be the same, but I suspect it). Thanks for the recipe!!!!!! I tried these the other night for my sis-in-law who’s from Gunsan. She said they were great but they usually got Kalbi made from pork as beef was so much more expensive. I bought some pork button bones and am going to try this marinade with them :o) Thanks for the great recipe! We must thank you for this recipe- my Malaysian wife made the Kalbi,using Lamb both with bones and without, and it was absolutely delicious. She served it to wrap in lettuce leaves with raw garlic as they do in the Korean restaurants. Now please give us the recipe for the yellow bean sambal to accompany it? Hello! I love the sound of your recipe! 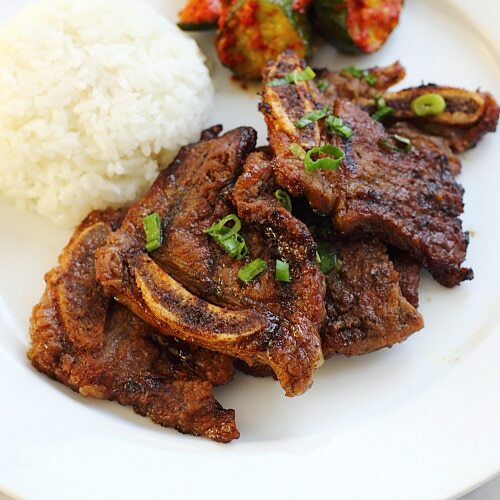 I grew up eating kalbi that my best friend’s grandmother always made for me :) I always wanted to try to recreate hers but I have never seen a recipe that looked similar. From what I remember hers seemed to be much larger pieces of meat that easily shredded apart…almost as if she used a chuck roast as you would for pot roast….does that sound like it might work for this recipe? She was very old and didnt speak english so I never attempted to ask how she made it. The only way I can think of possibly getting the same result as hers is to maybe use a marinade like yours…a chuck roast and maybe cooked in a crockpot or dutch oven. I would love and appretiate your thoughts on this! Oh and to add I know that Kalbi is usually with the short ribs and bulgogi uses just the sliced meat…for some reason this family called theirs Kalbi as well….? Oh well it was delicious!! Take care and love your blog! hey! 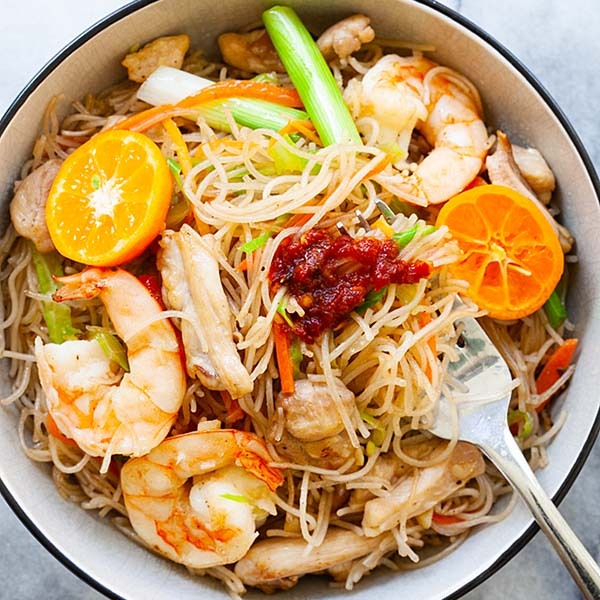 im a fan of your website, i’ve been making lots of chinese and malaysian foods lately, thanks to you. By the way, living in Malaysia, it’s pretty hard to get beef/lamb.. Only supermarkets sell them but still very limited. May i know where i can get “galbi” in Malaysia??? This is another great recipe. Quite simple and turns out really good, much better than the store bought bottled Korean BBQ marinate. I used tri-tip instead of short ribs. Thanks for the recipe again. Just pears should be easy to find. i have a large slab of short ribs, how should i cook these? i tried it once on the grill and the meat was a little tough, can i slow cook it using the same marinade? I love this recipe! Did not understand pre-soaking the ribs but seemed to an ease to the marinade. Overnight is so easy. Too cold here to BBQ so cooked them in the crockpot with the marinade: yummy! This is my new fave short rib recipe. Awesome thanks Mary for trying this Korean kalbi recipe.